HANKY PANKY was the star turn on the second day of the Tattersalls December Mare Sale, selling for 2,700,000 guineas on a day that also included the sale of Champion two-year-old TIGGY WIGGY for 2,100,000 guineas and the Oaks winner QUALIFY for 1,600,000 guineas. 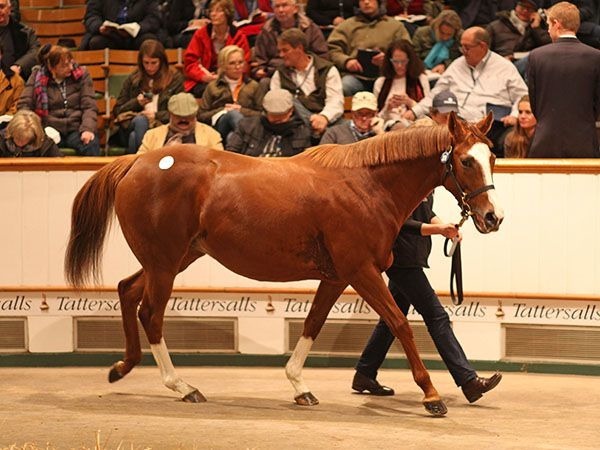 The second day of the sale saw a total of 162 lots sell for 27,657,000 guineas, at an average of 170,722 guineas and a median of 79,000 guineas. The GALILEO mare HANKY PANKY always looked one of the standout lots of the Tattersalls December Mare catalogue as the half-sister to Champion racehorse and sire GIANTS CAUSEWAY as well as to YOURESOTHRILLING, the dam of the dual Guineas winner GLENEAGLES and Irish 1,000 Guineas winner MARVELLOUS. The daughter of MARIAHS STORM was offered by Lady Carolyn Warrens Highclere Stud, in foal to DUBAWI on behalf of John Sikura. The Group placed five-year-old mare caught the attention of US agent Justin Casse, Turkish owner/breeder Ibrahim Araci as well as Fernando Diaz Valdez and John Warren, but it was Darleys John Ferguson who secured the mare with his bid of 2,700,000 guineas. “It is a huge privilege to sell a mare such as this,” said Lady Carolyn Warren, “and we thank John Sikura for entrusting us with her. She is a beautiful mare and ticked every box. Last years Joint European Champion two-year-old filly TIGGY WIGGY was the second highest price for the day when knocked down to MV Magnier for 2,100,000 guineas. The filly lit up the racecourse with her blinding speed, recording successes in the Group 1 Cheveley Park Stakes and Group 2 Lowther Stakes amongst her six victories in her freshman year. The daughter of KODIAC out of the KHELEYF mare KHELEYFS SISTER, was also placed in the Group 1 1,000 Guineas earlier this year for trainer Richard Hannon. MV Magnier secured the filly after seeing off Anthony Stroud and John Ferguson as well as Mandore Internationals Nicholas de Watrigant and Japans Northern Farm. Info & image with thanks & courtesy Tattersalls. copyright Tattersalls.